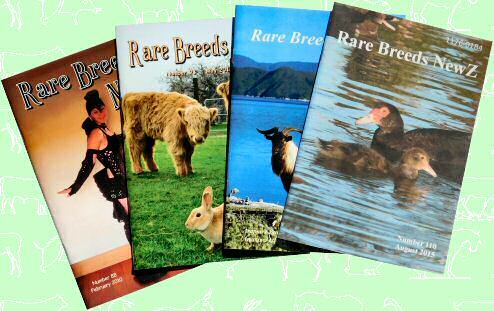 The Rare Breeds NewZ is a quarterly publication that is sent to members of the Rare Breeds Conservation Society of New Zealand, and which is available in some public and specialty libraries. Libraries that don’t have it in their collections generally have an interloan service through which copies can be obtained on loan. A full set of back numbers is held in the Rare Breeds Archives at Christchurch. Rare Breeds member Alison Sutherland has compiled an index of all articles that have been published (updated quarterly), and this can be downloaded here: Rare Breeds NewZ Index. The Index is ordered according to breed, but you can use your computer’s Find facility (usually Ctrl+F) to locate specific search words. Current issues usually have around 40 pages and are printed in colour. While stocks last, recent back numbers may be purchased from the Editor, editor (at) rarebreeds.co.nz for $5 each plus postage.